Sometimes you want to paint but you’re not sure what to paint. I know this is a problem I have sometimes, which is why I am excited to review Folk Art Fusion: Americana by Joy Laforme. If you’re a fan of American Folk Art or painting, then keep reading to find out why you need this book. The author Joy Laforme is an self taught artist and illustrator who is inspired by American Folk Art; “This style of art presented a bright, optimistic, and joyous picture of the United States from the 1700s to the early 1900s” Folk Art Fusion: Americana provides step by step instructions on how to paint 16 folk art inspired images. These are split into seasons which I think is a great idea if you’re looking to create seasonal home décor. At the beginning is information on the best types of paint and paper to use, as well as tips on drawing and painting. Perfect for a beginner. I love the range of paintings to complete, they range from shops and landscapes to still life and figurative scenes. 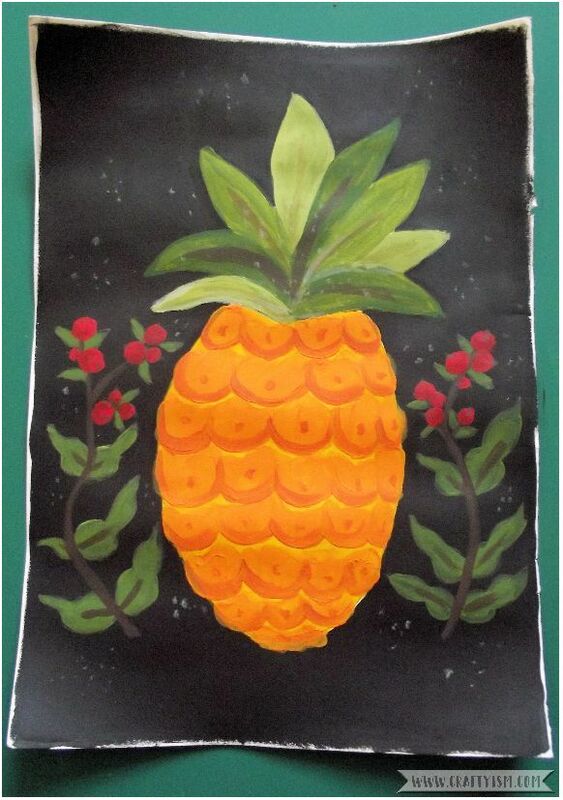 Looking through Folk Art Fusion: Americana the image of a pineapple on a black background stood out to me. It’s very bold and something I’ve never seen before, so I decided to use this tutorial to test out the book. First of all is the drawing. 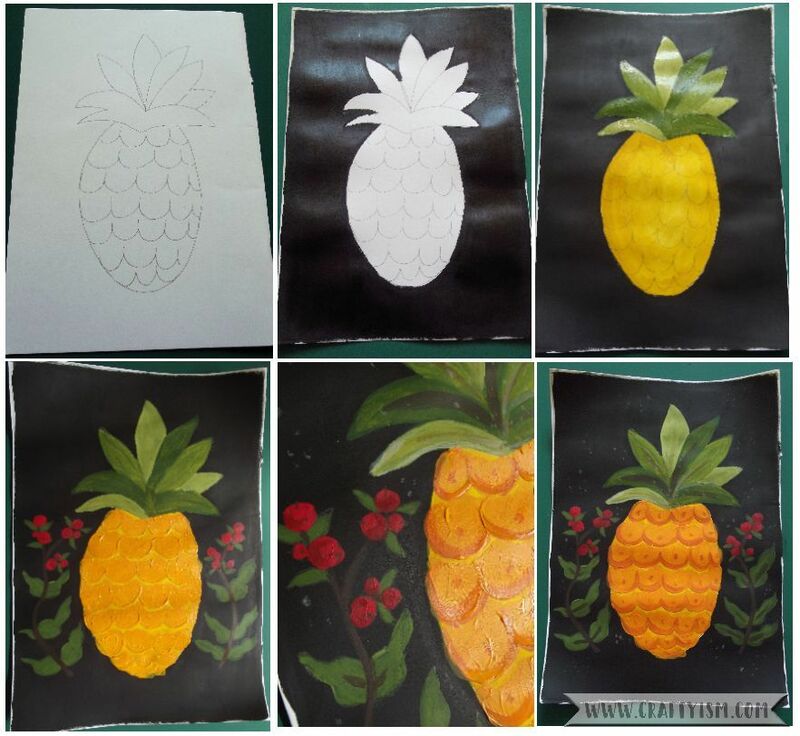 The pineapple was pretty simple, but you could probably trace the image if you’re not so confident drawing freehand. Next came the painting. The step by step instructions are so clear that it makes it very easy to follow along. You are also encouraged to mix your own colours, so even though you are following a tutorial, you’ll end up with a completely unique piece of art. Even if I say so myself, I think my pineapple looks great! The instructions really were so simple to follow and I would encourage beginners to have a go. The fact that all the steps are laid out for you, means you can just enjoy the act of painting rather than having to think! (very mindful) All of the paintings in Folk Art Fusion: Americana are so beautiful and I think they would make great handmade gifts, especially the Christmas themed images. I’m also inspired to try drawing some of my own images in this style, it’s so colourful and fun. If you’d like to start painting and you want beautiful results, I’d definitely give Folk Art Fusion: Americana by Joy Laforme a try! I was given an electronic copy of this book to review by the publishers. All thoughts and opinions are my own!